Ha, ha! No I didn't steal any pumpkins! *2 turban squash: totally food! *6 pie pumpkins: totally food! These make the 6 we picked up last week seem really tame! Wow! Those are some good meals waiting to happen--and some good seeds for plants, too, IF they are true breeds and not hybrids. But who knows? Even if they are hybrids, maybe you'll get "ancestor" plants, interesting in their own right. The parts you don't use, you can feed to livestock like goats and horses (though not for ones on sugar diet) or like I saw in one worm composting blog -- smash them up in a garbage can and feed them to the worms or add to compost. Save some seeds to grow next year? In any case, definitely a GOOD HAUL. 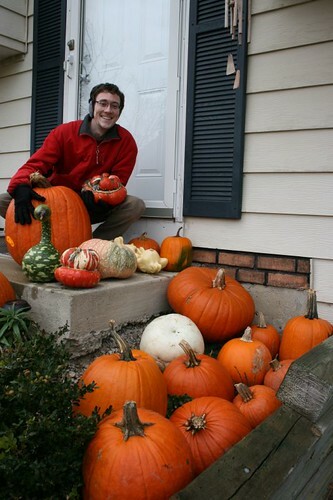 Wow that's a lot of pumpkins. Did I ever tell you how much I love roasted pumpkin seeds (hint hint)? And yes Apple I have about 8 pumpkins from Halloween in my compost right now. Put about 6 more in earlier. Oh wait you're talking about relieving others of their pumpkins. If I ever see any pumpkins or bags of leaves they're mine. I never see them though, I leave too early for work. trust me I even scout my neighbor hood every now and than. Let's not forget the straw bales people use for decoration in the fall. hmmm.... What else can we steal. Far be it that I encourage anyone to nefarious actions , but people buy pots and pots of mums for fall decorations, then throw them out, container and all, after they die down. (Sometimes the mums themselves are salvageable i.e. can be revived and planted in your own garden but that's a topic for another thread) What you have there are the mum foliage/roots (OM) and used potting soil (usually peat moss and perlite mix) destined for the compost pile, AND reusable containers for when your tomatoes and other transplants need up-potting.... Same with ornamental cabbage/kale, though not as much. If you are REALLY - uh, brave? - you can offer to relieve them of the dead plants BEFORE the owners decide to chuck them in their garbage, etc. Now look what you started Petalfuzz! Keep an eye out for more pumpkins. As well as anything else that is usable. Funny thing right after I read this post the first time I received an automatic email form my freecycle group from someone wanting unused pumpkins. Dooh! (<---Homer Simpson voice) I should have thought of that. :EDIT: I just went on freecycle and put a "Wanted" in for anything compostable including the things mentioned here. I already had one in for pots I just expanded on this one. gixxerific wrote: Now look what you started Petalfuzz! Gix, what's freecycle? Would I have something similar up here in Wyoming? Here you go Freecycle in Wyoming. Basically Freecycle is a way to give away and get things you want or don't need to people that want or don't need. It's getting rid of your usable unwanted items without it going to a landfill. Say you have for example an old desk or lamp you don't want anymore you post it and someone else might need that item. Vice Versa you may need a desk or lamp so you post that you are looking for one and someone may have what you need. It's all FREE no money ever. Just trading unwanted things to others, a great way to save the landfills and each other at the same time. I got an email back from someone already from my post yesterday, i haven't called them yet though it's still early. If you need any more help please ask, I'm here to help. It's not even "trading." Each transaction is usually one way or the other, you give *or* you get. Overall and over time, the group acts like a big swap meet. I've been active in three different FreeCycle lists for 2 or 3 years. At one point, I listed what I had donated/received, but it's gone far beyond that now. gixxerific wrote: Here you go Freecycle in Wyoming. Basically Freecycle is a way to give away and get things you want or don't need to people that want or don't need. It's getting rid of your usable unwanted items without it going to a landfill. Say you have for example an old desk or lamp you don't want anymore you post it and someone else might need that item. Vice Versa you may need a desk or lamp so you post that you are looking for one and someone may have what you need. Gix, this is wonderful! I just read through a gazillion postings. No pumpkins were offered, but now I know where to go when I need greens and browns. Best of all, I've been cleaning out my bookshelves, trying to make room for more Last week, I threw out an entire set of old encyclopedias. If you knew me and how much I love reading, you would know how very hard it was to dump them in the trash. Once I get together another bunch of books, I'll put them on this site. Oh, yeah. This has potential, serious potential, for gardeners! cynthia_h wrote: It's not even "trading." Each transaction is usually one way or the other, you give *or* you get. Yeah i worded that wrong, not a very good explanation but you get the point Stella and that's all that matters. My thread's been hijacked and I love it! Next garbage day is Tuesday, maybe I'll score some more great stuff and post again! petalfuzz wrote: har, har, har! Carolyn, truth be told, I'd rather hijack your pumpkins. I am suffering what someone in the leaf-theft forum would probably call "pumpkin envy"
I went to the freecyle link Gix gave me, and I searched pumpkins. A post came up made on December 2, 2008. Some lady wanted to get rid of four decorative Thanksgiving pumpkins. I reason that those are gone by now. However, after Thanksgiving, I'm gonna post a Pumpkins Wanted message.